This specially shaped vessel, called an aquamanile (from the Latin for “water” and “hand”), was used by kings, or obas, of the Benin Kingdom during hand-washing ceremonies. It was filled at the top of the head, its tail acted as a handle, and water was poured from its two nostrils. The leopard was an important symbol of the oba, embodying ferocity, intelligence, agility, and speed. The balanced posture indicates strength, while the perked ears and bared fangs show awareness and aggression—traits the king was expected to have. 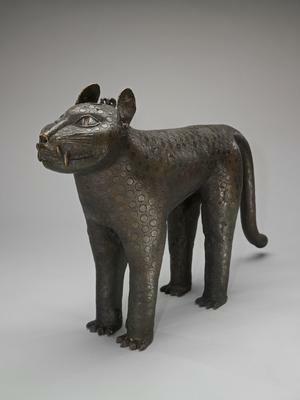 Animal-shaped aquamaniles were introduced between 900 and 1200 from the Islamic world to Europe, and brought to the Benin peoples by Portuguese traders who came by sea. In Benin belief, the mid-fifteenth-century king Ewuare the Great is credited with gathering aquamanile vessels from the underwater palace of Olokun, the god of the sea.